really nice article, but i’m wondering, how can we do same thing on Delphi XE? The Vcl Styles was introduced in Delphi XE2, so you can’t use it in Delphi XE. It seems to not work properly. Background color doesn’t change. If I select any tabsheet, border color changes only after sending window to taskbar. 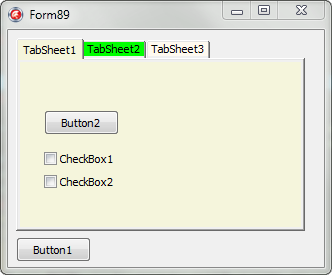 In the second screenshot tabsheet 4 is selected. Sorry. It was my mistake. It works perfectly except for “Self.UpdateTab(Page)” that gives me a lot of graphical problems expanding window or sending to taskbar. 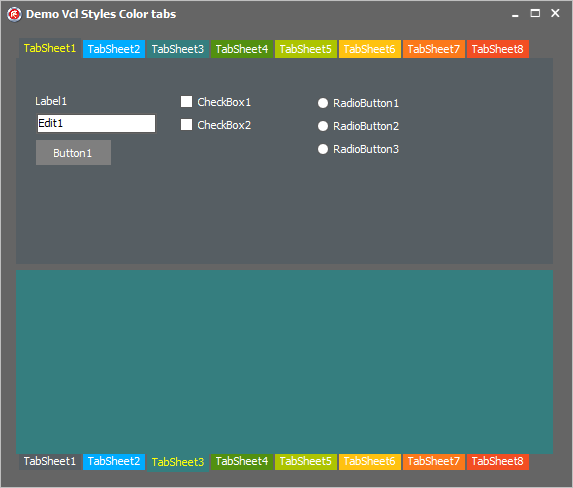 I was using your vcl styles sample to color the tabsheet on a pagecontrol. It works real nice. But how can I choose wich tab do I want to paint? Hi Pablo I can’t figure out what do you mean with “….how can I choose which tab do I want to paint” can you please rephrase you question and/or give a example of what do you want to accomplish? Very nice article. But have we need to use a Theme to use this customization ? Can we use it on the default Windows style ? Hi David, Sorry but this code only can be used with the VCL Styles. Per, to change the font color you need create a new style hook which descends from the TTabControlStyleHook class and override the DrawTab method.